Join us for more than 40 learning opportunities on topics such as DevOps, security, governance and compliance, digital transformation, scientific research and computing, and more. Dive into AWS solutions in multiple formats, including services intros, new service deep dives, and tech talks. Our sessions are separated into five primary tracks ranging in technical depth. Choose your path from the following themes: Build, Migrate, Secure, Operate, and Analyse. Sessions will cover an overview of services, features, and benefits with no prerequisites required. Sessions will dive deeper into service features, lessons learned, and deployment & architecture examples. Assumes an in-depth understanding of service use cases and AWS. 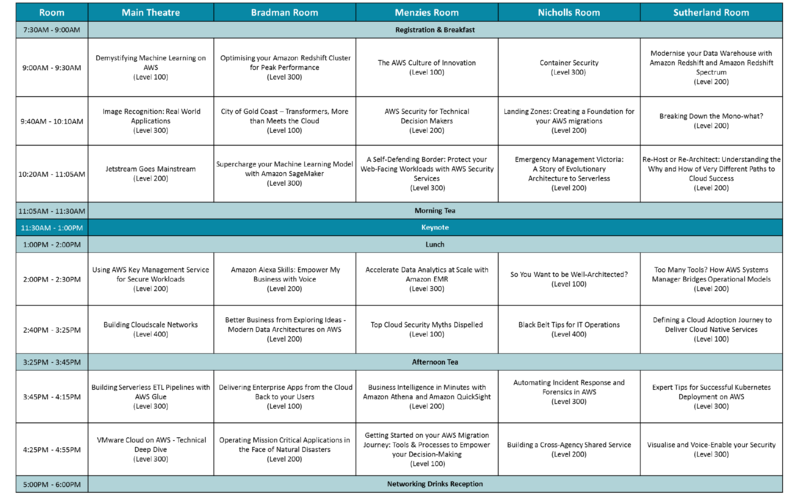 Sessions will focus on more complex topics such as advanced coding, architecture, infrastructure design, and solutions. Deep understanding of subject matter is assumed. The Summit Agenda and the Expo Hall Agenda is available for download. Hear how the Department of Industry defined a cloud adoption journey that enabled the migration of over 500 applications and 800 databases in 18 months. Developing an interative agile methodology that drive momentum to migration 25 applications per week to cloud. Open Universities Australia (OUA) provides distance education and online courses to students in Australia and other countries. OUA started running its websites and back-end systems for tasks like accounting and student management in a collocated data center but soon realized its infrastructure was not scalable enough to support planned growth and diversification. This is the story of how OAU went all in on AWS and transformed a multi-business strategy to a single platform business strategy focused purely on higher education. Follow OAU on their journey to where they are now - delivering applications and websites from a cost-effective, scalable infrastructure with the elasticity to support demand fluctuations and the automation to support continuous delivery. As organisations start to move their enterprise applications into the cloud they are faced with the challenge of providing their users a secure, performant, flexible environment to consume these apps. We will talk to three customers in a panel format that had this challenge and how they overcome it. Discover how AWS and APN Partner tools can help simplify your migration readiness and planning. Hear how customers have leveraged the AWS discovery and migration services to rapidly move workloads to improve resilience, reduce risk and accelerate their global footprint, and find ways these tools can be used for quick, effective decision making and planning in critical situations. When migrating lots of applications to the cloud, it's important to architect cloud environments that are efficient, secure, and compliant. AWS Landing Zones are a prescriptive set of instructions for deploying an AWS-recommended foundation of interrelated AWS accounts, networks, and core services for your initial AWS application environments. This session will review the benefits and best practices. This session provides a framework to evaluate the most commonly used migration approaches and helps your organisation choose the right path for each application. Explore the six Rs of application migration before diving into the benefits of re-architecting including: faster time to market, more resilient architecture, developing a flexible platform for future development, and innovation. What are the best practices for incorporating VMware Cloud on AWS into your existing architectures? You’ll learn about design considerations for integrating your Software Defined Data Centers (SDDCs) with native AWS services, and hear how VMware Cloud on AWS helps leverage your existing investments while providing the scalability, agility and security of AWS. Is the cloud as secure as my on-premises infrastructure? When I put data in the cloud do I lose ownership of it? In this session we will cover the most common cloud security questions that we hear from customers. We provide detailed answers for each question distilled from our practical experience working with organisations around the world. This session is for everyone curious about the cloud, cautious about the cloud, or excited about the cloud. This session is designed to build on from the information you have learned in an AWS Overview, Technical Essentials, or an Immersion Day. It will arm Technical Decision makers with the AWS's best practice, a framework to decide which services to watch, and our top 5 tips for success. We'll focus on the next steps for building out these practices and equip you with resources to empower your future projects. Powerful encryption capabilities are available in the core services of the AWS cloud. AWS continues to release enhancements to encryption-specific services and expand encryption capabilities in new services to make security easy for everyone. Learn how to take advantage of these services and features to protect and secure your data in the cloud. Security doesn't have to be time-consuming. Learn how to build a self-defending border to protect your Internet-facing applications. In this session we will look at how services, once the realm of architects and developers, can augment traditional security services allowing you to create a self-defending architecture that dynamically responds to the threats facing your online assets. Come discover the latest and greatest tricks for automating your incident response and forensics in the cloud. This session focuses on automating your cloud incident response processes covering external and insider threats, triggers, canaries, containment, and data loss prevention. We'll demo how to perform basic disk based forensics on an EC2 instance using open source projects. Learn how to leverage the identity and authorisation, network security and secrets management features of the wider AWS platform for their containers. We will also show you how to scan container images for vulnerabilities as part of your CI/CD pipeline. Security oversight requires you to keep tabs on the near-real-time state of resources within your environment and provides challenges such as the management of large data sets from multiple sources. Join us to learn how you can build your own analysis and monitoring platform, providing both visual and audible alerting. The AWS Well-Architected Framework enables customers to understand best practices around security, reliability, performance, and cost optimisation when building systems on AWS. This approach helps customers make informed decisions and weigh the pros and cons of application design patterns for the cloud. In this session, you'll learn about the Well-Architected Framework, and the steps you can take to help ensure your solution is Well Architected. Geoscience Australia monitors, analyses and reports on significant earthquakes, using this data to inform activities in Australia’s earthquake hazard program and tsunami warnings issued by the Joint Australian Tsunami Warning Centre. Their website, Earthquakes@GA can be used to find information on recent earthquakes, search the earthquake catalogue, submit a report about an earthquake, and subscribe to notifications about earthquakes on Geoscience Australia's radar. Earthquakes@GA recently moved to the AWS cloud to manage the large spikes in demand that the website experiences after an earthquake. In this session, join Bill Farmakis from Geoscience Australia as he breaks down their move to the cloud and how systems were operationalized in AWS. Come and see first-hand how AWS Systems Manager can help you manage your servers at scale with the agility and security you need in today's dynamic cloud-enabled world. Systems Manager simplifies resource and application management, shortens the time to detect and resolve operational problems, and makes it easy to operate and manage your infrastructure securely at scale. Hear from Australian Geospatial Organisation (AGO), as they share their journey of processing 187 TB of image data in 4 days with 7.32TB of RAM244 cores for less than $1,500 using serverless architecture to dynamically view data as an OGC service. AGO tells the story of adopting Jetstream, an AWS hosted solution, to develop and run multiple geospatial capabilities in support of humanitarian and disaster relief efforts. Jetstream has empowered Defence to move from a cumbersome waterfall approach to a mature DevOps model, designed to be operationally resilient and fulfill all security requirements. Running and managing a Kubernetes environment at scale can be easier than you think! In this session we will share some expert tips that can help you run production grade Kubernetes deployments on AWS. We will review native AWS services you can use to improve security, deployments, networking, logging and monitoring, and CI/CD. We will also highlight third party services that are popular across a multitude of customers. Join this session for a deep dive into cloudscale network patterns with Nicolas Meessen, Senior Principal Network Engineer, Atlassian. Learn how to build any-to-any connectivity between over 40 VPCs in a region, deploy any-casted private services inside of AWS, and create private connectivity between DX-connected regions. If you are a network administrator or systems architect then this is the perfect session for you. Black Belt tips makes a comeback for the fifth consecutive year. How you used the AWS platform last year should be different to how you utilise it today. In this advanced technical session, learn about latest changes in compute, networking, and security. Understand how new architecture patterns will allow you to maximise performance efficiency, reliability, and security on AWS today. Learn how AWS cloud services can be combined with process and culture changes to enable advances in innovative thinking. We'll look at how Amazon uses AWS to unlock the potential in their teams and share some of the tips, tricks and techniques that help leverage cloud technology to its maximum advantage. The Deparment of Planning, Transport and Infrastrcture (DPTI) in South Australia has built a multi-agency platform for Geospatial services. This platform is now in use by 17 different government agencies, including critical emergency services capabilities. Learn how DPTI overcame challenges of culture, change and software licensing to create a cost-efficient, fast, resilient GIS platform, using a mixture of commercial and open-source software. Voice experiences have transformed the way customers interact with the world. Alexa is Amazon’s voice service and the brain power behind millions of devices including Amazon Echo. Alexa provides capabilities, or "skills", that enable businesses to create a more personalised experience and engage with employees or customers through voice. In this session, we’ll provide an overview of Amazon Alexa to demonstrate how to create business value and reach more customers. Microservices, containers, serverless - these industry buzzwords are hot right now. Breaking down monolithic applications and architectures is a central theme across industries as organizations move to adopt new technologies and take advantage of the AWS cloud to scale, while rapidly innovating to meet changing customer expectations and competitive challenges. In this session, we'll take a closer look at what is actually required to "break down the monolith" and provide some strategies and design patterns for building microservices on AWS. In this session you will hear from Emergency Management Victoria’s Chief Architect, Michael Jenkins, about EMV’s journey to building a mission critical, multi-agency emergency management system on the AWS Serverless platform. See how Public Sector organisations and AWS Partners are leveraging Smart Devices and Artificial Intelligence to create flexible, secure and cost-effective solutions. By integrating learning models to live video/audio, cameras can be transformed into flexible IoT devices that perform critical functions around public safety, security, property management, smart parking & environmental management. Observe how to architect these solutions using AWS services such as AWS IoT Core, AWS GreenGrass, AWS DeepLens, Amazon SageMaker and Amazon Alexas. In today’s digital economy, IT organisations are increasingly using public cloud technologies and services to meet their needs for increased agility, innovation and cost management. With the use of such technologies presents the need to protect these environments to maintain competitiveness, comply with regulations, and manage your brand reputation. In this session, we demonstrate how to build a resilient AWS environment that addresses the need for high availability and data protection in your ever evolving journey to a multi-cloud infrastructure. Udrew is a cloud platform for home owners and contractors to design, engineer, and manages its own custom building project from start to finish, to receive instant council approval. When Australia's largest public sector self-insurer, Insurance & Care NSW (icare), was looking for an urgent solution to relieve pressure on its constrained internal network and internet links, it called on Cloudten. Cloudten entered at a critical stage of the process to help design, deliver, and support a new environment that would provide a scalable and secure outbound gateway for icare. By leveraging core AWS services, they were able to quickly and effectively deploy a Sophos Unified Threat Management (UTM) solution across multiple Availability Zones. This project is a great example of end-to-end automation, as it demonstrates the ability to quickly and effectively deliver positive outcomes in previously impossible time frames. Discover how you can leverage AppStream 2.0 to securely and cost effectively deliver high-end graphics and CPU-intensive applications, such as Esri ArcGIS, to your users. Then, learn how to consume it from anywhere, on any device. This session will contain a demo showcasing Esri ArcGIS Pro in AppStream2.0. Elizabeth Cannon, CFO, University of the Sunshine Coast. Learn how to automate security controls such as virtual patching and container security to ensure that security is baked in from the ground up. Forgetting to manually apply security controls before applications are productionised can lead to exploitation of vulnerabilities that could have easily been automatically secured. GovCMS is a service provided by the Department of Finance that has been used by 77 government agencies to help deploy 233 websites. Powered by AWS, GovCMS provide Platform as a Service (PaaS) and Software as a Service (SaaS) - based solutions to help migrate or create content-rich websites in accordance with the Australian Government’s Digital Service Standard. In this presentation, you’ll hear about our journey to re-architect a large, complex registry system for the Victorian Government, how we overcame delivery challenges, and AWS’s role in the successful outcome. Designed to provide a digital service platform for one of the state government’s key data sets, the cloud-based system enables the government to respond quickly to ever-increasing citizens’ needs. It also provides a secure and robust solution capable of meeting legislative requirements over the long-term. IntelliHQ is a machine learning specialist in the healthcare space, and is the innovator behind a cloud-based precision medicine data platform. TechConnect is IntelliHQ’s cloud technology partner, and our strong relationship with AWS and the AWS life sciences team has enabled us to deliver the first steps toward building out this groundbreaking solution. With the growth of applications, accounts and Virtual Private Clouds (VPC), managing individual connections, protecting traffic from inbound/outbound threats, command-and-control and data exfiltration security becomes complex and cumbersome, slowing deployments. Transit VPC architecture with Palo Alto Networks VM-Series, simplifies management and reduces costs using a shared services approach to centralise connectivity and security. Cloud technologies are helping organisations transform their businesses, making employees with cloud skills in high demand. AWS Training has teamed up with organisations to harness the foundational skills of existing IT staff – those focused on traditional IT infrastructure – to develop the cloud skills they need to accelerate cloud adoption, achieve business objectives sooner, and innovate faster. During this session, we’ll discuss how investing in training is imperative to reaping the benefits of your cloud investment, and how AWS has helped organisations through this journey. Many diversity efforts in technology begin by focusing on women as a first step. But as these efforts grow, not all women feel included or represented. How do we prioritize their inclusion on technical teams? What can leaders do – from cultivating the pipeline, to hiring, to internal strategies – to make the future of tech more diverse and inclusive? Attend a panel discussion of expert technical leaders to explore inclusion around race, gender identity, ability status, and other underrepresented and intersectional communities. Attendees will leave with solutions on how to prioritize inclusion and drive results. Join us for a live demo of business intelligence powered by artificial intelligence (AI). Learn how to auto-discover and baseline your full stack in minutes, gain visibility across AWS Lambda and IoT devices, and troubleshoot performance issues with Amazon Alexa. Dynatrace is one of the first companies to achieve the AWS Migration Competency and is a member of the AWS Government Partner Program. Best practises and uses cases on how Veritas works with organisations in solving data and application availability, protection and information visibility challenges as they adopt Amazon Web Services to enhance their overall cloud experience.